A Newsletter for Investors who work with us. Because there are many new Investors here at Sun Pacific, it’s a good time to review how we can work better together. With increased business it is imperative to be more efficient. 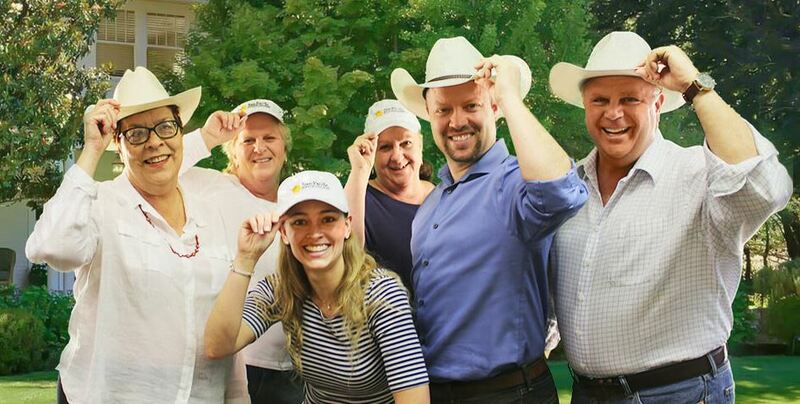 We are a hard-working, fun-loving group here at Sun Pacific Mortgage & Real Estate. We have been doing Hard Money Loans since 1988 – in our 30th year now. We are a family owned business in Santa Rosa, California (north of San Francisco in the Sonoma County wine country). We are Hard Money Brokers. We do not service loans, we don’t have a pool, we don’t have a Trust Account, we don’t have an escrow company – we promote loans and place them with investors. Yes, almost 30 years of doing just that. We gather a complete loan submission file that includes a loan application, credit report, preliminary title report, value of property, proof of income and reserves. We publish a Trust Deed Offering via email (see picture below), with loan to value, property address, bit of information about buyer and property. When an interested investor responds back, we send the full loan submission package to them so they can make an informed decision. You should be aware that we do a fair amount of vetting on each loan that comes to us. Only 1 out of about 6 that come to us for a loan meet our qualifications before it even goes out to you as the Investor. Our policy is “One Loan, One Investor” (we do not have a pool of money from investors sitting in a trust account). When this isn’t possible (due to size of loan, etc.) we will, occasionally, fractionalize the loan (we allow several investors to put in a fraction of the loan amount until the total is met). Did you know that you need to qualify to invest money in Hard Money Loans? This is a Federal Rule, enforced by the State of California. You CANNOT invest more than 10% of your net worth!!! And….. net worth does not include your home, furnishings and automobiles. Give us a call to help determine what your net worth is. Once the loan is approved we prepare HARD MONEY LOAN DOCUMENTS for the borrower(s) to sign. These are specific documents from a HARD MONEY LOAN DOCUMENT PROGRAM that we use. These loan documents are sent to ESCROW with a copy of the Promissory Note and Deed of Trust and a copy is sent to you for your review. At that time we give you an estimate of when the loan will need funding (when and where to wire your money to ESCROW). 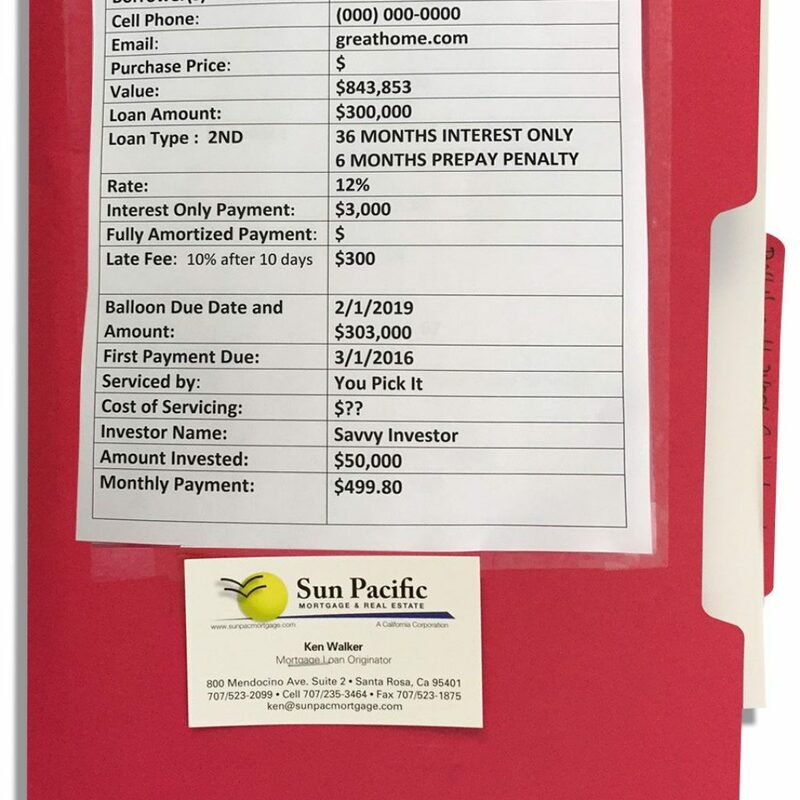 Once the HARD MONEY LOAN DOCUMENTS are signed in ESCROW, you have funded the loan, and it is now closed; that’s when we send you the famous INVESTOR RED FILE. Included in it is a copy of all signed loan documents. On the front of the file is a simple summary: Name of Borrower, Address of Property, Loan Amount, Interest Rate. Here’s a picture of a Famous Investor Red File! Note: You will receive your pro-rated interest with this file. You will receive any reimbursement of wire fees directly from Escrow, as this is a cost the borrower covers. Average time from start to finish for us is 14 days – just two weeks. If you are getting the loan serviced by a Servicing Company, YOU MUST inform the Servicing Company, fill out their forms, and have it set up. We do not set up servicing for you. We do provide a copy of the loan docs to the Servicing Company. If you like, we have a small list of Servicing Companies we can send you. Please read the Investor Welcome email that we send you, right after you are added into our Investor database. Included is a booklet from State of California about investing in Hard Money. If not already given, we will ask you to give us your name, address, phone #, email address and a few other questions regarding Hard Money lending. We will add you to our email list of investors and start emailing you Trust Deed Offerings. Here is a pic of what it will look like. When you see a Trust Deed that you are interested in, and have money available to place on that Trust Deed, all you need to do is hit “Reply” on your computer and state that you are interested. You are not approving the loan with this and you may ask any other questions you have at this time. Your email response goes to both Forest and Ken, our Broker and Loan Originator, who are putting the loans together.Whoever’s Trust Deed it is (Forest or Ken), they will respond to you with the loan package, if it is still available. If the loan is no longer available, you will still be contacted. If you are not contacted or do not receive a response within 24 hours, please call or send in another email. We have found that there are many email systems that pick up this verbiage as spam. We have a policy that every email or phone call gets responded to as quickly as possible. On a very busy day that may be as long as 24 hours, but never more than that. Once you receive the loan submission, you should review it and exercise any other due diligence until you are comfortable with that loan or wish to decline it. Please note that these loans generally require a fast turn-around, so we appreciate a speedy review and approval or notice of decline. Taking longer than 24 hours is a disservice to the Borrower. Borrowers come to us for the speed and performance we offer in getting their loan done. They do not come to us for the interest rate! Once you approve the loan, we will ask for your vesting and your choice of Servicing Company. We are unable to prepare LOAN DOCUMENTS without this information. Get your funds ready so they can be wired to escrow in a timely fashion. 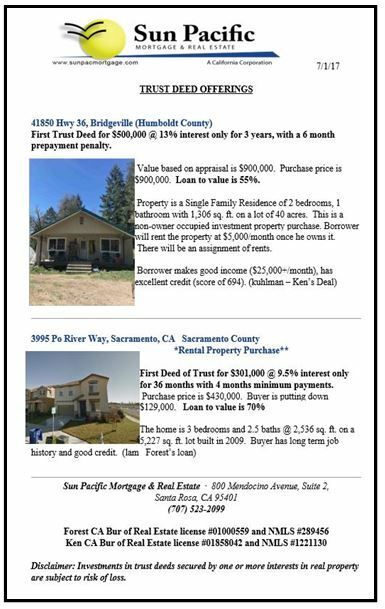 Send the money to Escrow when requested. Receive and review the “Famous Investor Red File” (shown to the right) – which is sent to you by us Priority Mail.